Mars has a diameter about half that of earth. A Martian day is about 24 ½ hours long, and its year is about twice as long as an earth year. Its axis of rotation is tilted slightly, causing it to have seasons corresponding to those on this planet. Each of the four seasons is about 6 of our months long. Mars does have a more elliptical orbit than does the earth. Because of this, it is considerably closer to the sun during the southern summer, and further away during the southern winter. As a result, the southern hemisphere experiences warmer summers and colder winters than the northern hemisphere does. The temperature gets so low in the the south polar region that carbon dioxide freezes out of the atmosphere, significantly reducing the atmospheric pressure all over the planet during the southern winter (2). It is in the southern hemisphere, during the summer, that most major planet wide dust storms erupt. It has been suggested that rapid thawing and vaporization of subsurface ice could be the cause of these violent events. yellow for the highlands. The tallest peaks are blue. The Hellas Basin area was selected for this data analysis because its relatively unusual character. The over 2000 km wide basin, created by an ancient meteor impact, is in places more than 7000 meters below the mean planetary horizon. It is believed to be the lowest place on the planet. It is located at about 40 degrees south latitude, similar to that of central Argentina, and Melbourne, Australia. The Basin is one of the areas in which dust storms frequently erupt. It is also unusual because there are very few craters there. Because of its latitude and great depth, it seems likely that there is an abundance of water ice under the surface in the Hellas Basin. Mossbaur spectra, which can detect the presence of hydrogen, suggest that, except for the poles, this may be one of the "wettest" places on the planet. It may possibly be the last place where liquid water ever existed on the surface of Mars. In mid summer, it is one of the "garden spots" of the whole planet, with atmospheric pressure of over 10 millibars, more than twice what it is at the mean planetary horizon. Since the vapor pressure of water is lower than 10 millibars if the temperature is less than 60 deg. F (16 deg. C)(4), this may be one of the few places on the planet where any water on the surface will not immediately boil away. The days are long and relatively warm, and the nights are fairly mild, considering how far north the Hellas Basin is located. Summertime temperature vs. time curves for the Viking Landers were reported in 1977 (1). These curves are similar in appearance to those obtained in deserts on the earth, though the vertical scale on the Martian curves are considerably larger. Those for Viking II are shown in Figure 2. They indicate a summertime temperature variation of about 80 deg. F (44 deg. C). Dust storms do not cause much change in the mean daily temperature, but the difference between the high and low temperature on a given day can be greatly reduced from what it would be when the air is clear. Figure 2: Temperature Curves for Viking II (1). Late afternoon temperatures in the Hellas Basin are generally near or slightly above 0 deg. F (-18 deg. C), and nighttime temperatures at 2:00 AM are about 50 deg.F (-46 deg. C). Sometimes early morning temperatures at the lower altitudes can be unusually cold, possibly because of cold air pooling when there is little or no wind. Temperatures for different times during a Martian day can be estimated, using data obtained from the Viking spacecraft, which landed on Mars in 1979. The curve shown in Figure 3 was adjusted from the most symmetrical of the three curves in Figure 2 to fit the temperature data from the Hellas Basin. It should be a fairly good match, as Viking 2 is about as far north of the equator, as Hellas is south of it. For a midsummer day in which the 6:00 PM temperature was 0 deg. F and the 2:00 AM temperature was of -50 deg. F (-46 deg. C), it is estimated from the temperature curve that the high temperature would probably be near freezing. The daily maximum soil temperature is about 45 deg. F (25 deg. C) warmer than the air temperature, or about 75 deg. F (24 deg. C) on the warmest days (1). Because the low point on the curve is at about 3:00 AM, the low temperature would be about -50 deg. F (-46 deg. C). The least cold morning temperature reported was -42 deg. F (-41 deg. C) in early summer. Early morning soil temperatures are about the same as the air temperatures. Winter, of course, is a different story. With the short days and long nights, temperatures are much colder, dropping at night down to -140 F (-96 deg. C). I did not find any temperature data about winter daytime temperatures in the Hellas Basin. The less cold winter nighttime temperatures may have resulted from dust in the air following a major dust storm in the northern hemisphere or equatorial regions. Five plots of temperature vs. altitude for different times of the year are shown in Figure 4, below. Each covers a series of one or more days. The numbers below each plot indicate on which day of the series each data point was recorded. Figure 4 Plots of Temperature (Deg. F) vs Altitude. The data indicates that the nighttime temperatures are generally warmer at the lowest altitudes. This is probably because the higher density of the atmosphere and protection from prevailing winds allows heat to be better retained than on the surrounding high plains. In contrast, most of the few daytime temperatures that were reported indicate only a very slight dependence on altitude. However, on one day in mid summer, the nearby highlands were 20 deg. F (11 deg. C) cooler than the bottom of Hellas Basin. Note that the late winter early morning temperatues are much warmer than the early spring temperatures recorded two years earlier. The warmer temperatures may have resulted from atmospheric dust from a recent dust storm. Figure 5 shows temperature variations at different altitudes in the Hellas Basin Area for sixty days from mid summer into late summer. The temperature plots indicate the 2:45 AM temperatures at the lower elevations are consistently warmer, and show less variation than at the higher altitudes. The most temperature variation occurs at altitudes above 1500 m. This should not be surprising, because of the denser atmosphere at low altitudes and the protection from prevailing winds of the surrounding highlands. The temperatures for altitudes of 0 to 1500 m do seem to be punctuated with a few very fast drops in temperature that are of greater magnitude than those shown by the other two altitude plots. This might be related to the pooling of cold air when the air is calm. Figure 5. Summertime temperatures at different altitudes at 2:40 AM. The three plots suggest that a cold air mass moved across the Hellas region around day 20, a less intense one between days 30 and 40, and a moderate drop in temperature in the vicinity of day 44. Some of the variations in the low points in the curves may stem from the very wide area (4800 km east to west and 1600 km north to south) over which the measurements were taken. The temperatures at days 50 and beyond show a significant cooling as the season moves into late summer. The following is a discussion of temperature and pressure data that were all recorded at different longitudes at 68 degrees north latitude during the Martian spring. The local mean time for each reading is within a few minutes of 2:47 AM mean time on the same day. The data was collected in December of 2002. Figure 6 below shows an overview of the weather that was occurring all around Mars within a few minutes of 2:47 AM local mean time. It shows plots of temperature, height in meters above the mean altitude, and what the atmospheric pressure would be if the site measured was at zero meters altitude. The zero altitude atmospheric pressure was estimated from a plot of altitude vs. pressure readings obtained at about 2:20 AM at different altitudes in the Hellas Basin region during the late summer. If you compare the temperatures here with the few available for spring in the vicinity of the Hellas Basin, you will notice that the temperatures here are much warmer. I suggest three reasons for this disparity. Firstly, the surface over most of this latitude is much lower than the highlands that surround the Hellas Basin. The heavier blanket of atmosphere over this wide area reduces the heat loss during the night. You do not get the phenomenon of heavier cold air descending from the highlands that you would expect to happen in the Hellas Basin. Secondly, because of eccentricity of Mars' orbit, the winters in the northern hemisphere are not as cold as they are in the south. It is reasonable to expect that the evaporation of frozen carbon dioxide covering the southern ice cap would slow the warming that occurs with the coming of spring. The northern ice cap does not get cold enough to accumulate nearly as much solid carbon dioxide, allowing for a more rapid warming in the spring. The plots of atmospheric temperature and altitude seem to indicate, as one would expect, that the nighttime temperatures are colder at the higher altitudes. But the altitudes are all between, -4000 meters and -5500 meters, an altitude range of less than 1500 meters. The Hellas Basin area showed much less temperature-altitude dependence over this altitude range. Therefore, it is likely that much of the temperature variation can be attributable to weather systems, rather than nightime heat loss due to radiation and convection. At 90 degrees longitude, the estimated atmospheric pressure is above 5.5 millibars, suggesting the presence of a high-pressure area. The temperature on the east side of this air mass is about -70 degrees F, while it is 20 degrees warmer on the west side. This would suggest the clockwise motion of a cold air mass dropping down from the polar regions. To the east, at about 180 degrees longitude there appears to be a low-pressure area that cold air from the high-pressure area is feeding into. But there is little evidence of any warm air being pulled up by the counterclockwise motion of the low-pressure area. At the postion where one would expect the warmest temperature would be, there is a seven degree temperature dip. I have read that the air temperature in still air on Mars is much warmer close to the ground. It follows from this that a wind strong enough to disrupt this layer of warm air would be expected to cause a temperature drop, even if it is pulling air in from the south. Note that the temperatures recorded immediately to the east and west (where the wind would be expected to be less) are slightly warmer than points east and west of them, respectively. There appears to be another large air mass at about 300 ( or -60) degrees latitude. This could be attributable to a weaker and less active high-pressure area. Unlike the other high pressure area, it is not a cold air mass. It is also different in that it does not appear to have a nearby low pressure area associated with it. S.L. Hess, R. M. Henry, C.B. Leovy, J.A. Ryan, and J.E Tillman Meteorological Results from the Surface of Mars: Viking 1 and 2, Journal of Geophysical Research 82, p 4559, Sept 30, 1977. J. A. Ryan, R. M. Henry, S.L. Hess, C. B. Leovy, J.E. Tillman, C., Mars Meteorology: Three Seasons at the Surface, Geophysical Research Letters 5, August 1978, p 715. Vladimir A. Krasnopolsky and Paul D. Feldman, Detection of Molecular Hydrogen in the Atmosphere of Mars, Science 295, 30 Nov 2001, p 14. Hugh H. Kieffer, Mars Volatiles (and Meteorology and Dust), p 2793. Terry Z Martin, Alan R. Peterfreund, Ellis D. Miner, Hugh H. Kieffer, and Garry E. Hunt, Thermal Infrared Properties of the Martian Atmosphere, 1, Global Behavior at 7, 9, 11 and 20 um, p 2830. Terry Z. Martin and Hugh H. Kieffer, Thermal Infrared Properties of the Martian Atmosphere, 3, Local Dust Clouds, p 2853. Garry E. Hunt, Thermal Infrared Properties of the Martian Atmosphere, 4, Predictions of the Presence of Dust and Ice Clouds From Vikikng IRTM Spectral Measurements, p 2865. Donald W. Davies, The Vertical Distruibution of Mars Water Vapor, p2875. C.B. Farmer and P.E. Doms, Global Seasonal Variation of Water Vapor on Mars and the Implications for Permafrost, p2881. Philip B. James, Geoffrey Briggs, Jeffrey Barnes, and Andrea Spruck, Seasonal Recession of Mars' South Polar Cap as Seen by Viking, 2889. Seymour L. Hess, Robert M Henry, and James E. Tillman, The Seasonal Variation of Atmospheric Pressure on Mars as Affected by the South Polar Cap, p 2923. James B. Pollack, David S. Colburn, F. Michael Flasar, Ralph Kahr, C.E. Carlston and D. Pidek, Properties and effects of Dust Particles Suspended in the Martian Atmosphere, p 2929. James e. Tillman, Robert M. Henry, and Seymour L. Hess, Frontal Systems During Passage of the Martian North Polar Hood Over the Viking Lander 2 Site Prior to the First 1977 Dust Storm, p 2947. Conway B. Leovy and Richard W. Zurek, Thermal Tides and Martian Dust Storms: Direct Evidence for Coupling, p 2956. Seymour L. Hess, Static Stability and Thermal Wind as an Atmosphere of Variable Composition: Applications to Mars, p 2969. James A. Cutts, Karl R. Blasius, and W. James Roberts, Evolution of Martian Polar Landscapes: Interplay of Long-Term Variations in Perennial Ice Cover and Dust Storm Intensity, p 2975. Michael H. Carr, Formation of Martian Flood Features by Release of Water from Confined Aquifers, p 2995. Mendillo, M., X. Pi, S. Smith, C. Martinis, J. Wilson, and D. Hinson, Ionospheric effects upon a satellite navigation system at Mars, Radio Sci., 39, RS2028, doi:10.1029/2003RS002933, 2004. Bougher, S.W., S. Engel, D.P. Hinson, and J.R. Murphy, MGS radio science electron density profiles: Interannual variability and implications for the Martian neutral atmosphere, J. Geophys. Res., 109, E03010, doi:10.1029/2003JE002154, 2004. Hinson, D. P., and R. J. Wilson, Temperature inversions, thermal tides, and water ice clouds in the Martian tropics, J. Geophys. Res., 109, E01002, doi:10.1029/2003JE002129, 2004. Mendillo, M., S. Smith, J. Wroten, H. Rishbeth, and D. Hinson, Simultaneous ionospheric variability on Earth and Mars, J. Geophys. Res., 108(A12), 1432, doi:10.1029/2003JA009961, 2003. Krymskii, A. M., T. K. Breus, N. F. Ness, D. P. Hinson, and D. I. Bojkov, Effect of crustal magnetic fields on the near terminator ionosphere at Mars, J. Geophys. Res., 108(A12), 1431, doi:10.1029/2002JA009662, 2003. Hinson, D. P., R. J. Wilson, M. D. Smith, and B. J. Conrath, Stationary planetary waves in the atmosphere of Mars during southern winter, J. Geophys. Res., 108(E1), 5004, doi:10.1029/2002JE001949, 2003. Hinson, D. P., and R. J. Wilson, Transient eddies in the southern hemisphere of Mars, Geophys. Res. Lett., 29(7), 10.1029/2001GL014103, 2002. Hinson, D. P., G. L. Tyler, J. L. Hollingsworth, and R. J. Wilson, Radio occultation measurements of forced atmospheric waves on Mars, Journal of Geophysical Research (Planets), vol. 106, no. E1, pp. 1463-1480, 2001. Bougher, S. W., S. Engel, D. P. Hinson, and J. M. Forbes, Mars Global Surveyor radio science electron density profiles: Neutral atmosphere implications, Geophys. Res. Lett., 28, 3091-3094, 2001. Tyler, G. L., G. Balmino, D. P. Hinson, W. L. Sjogren, D. E. Smith, R. A. Simpson, S. W. Asmar, P. Priest, and J. D. Twicken, Radio science observations with Mars Global Surveyor: Orbit insertion through one Mars year in mapping orbit, J. Geophys. Res., 106(E10), 23,327-23,348, 2001. Tracadas, P. W., M. T. Zuber, D. E. Smith, and F. G. Lemoine, Density structure of the upper thermosphere of Mars from measurements of air drag on the Mars Global Surveyor spacecraft, J. Geophys. Res., 106(E10), 23,349-23,357, 2001. Joshi, M., R. Haberle, J. Hollingsworth, and D. Hinson, A comparison of MGS Phase 1 aerobraking radio occultation data and the NASA Ames Mars GCM, Journal of Geophysical Research (Planets), vol. 105, pp. 17601-17616, 2000. Ahmad, B., and G. L. Tyler, Systematic Errors in Atmospheric Profiles Obtained from Abelian Inversion of Radio Occultation Data: Effects of Large Scale Horizontal Gradients, Journal of Geophysical Research (Atmospheres), vol. 104, no. D4, pp. 3971-3992, February 27, 1999. 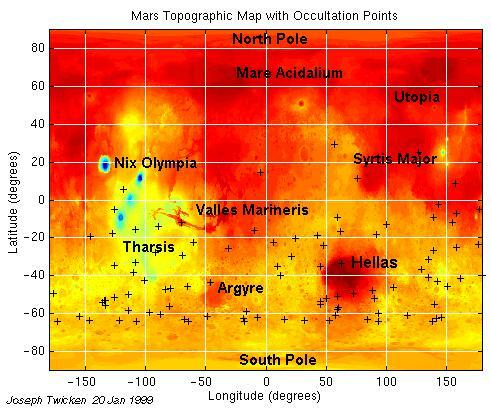 Hinson, D. P., R. A. Simpson, J. D. Twicken, G. L. Tyler, and F. M. Flasar, Initial Results from Radio Occultation Measurements with Mars Global Surveyor, Journal of Geophysical Research (Planets), vol. 104, no. E11, pp. 26297-27012, 1999. Ahmad, B., and G. L. Tyler, The two-dimensional resolution kernel associated with retrieval of ionospheric and atmospheric refractivity profiles by Abelian inversion of radio occultation phase data, Radio Science, vol. 33, no. 1, pp. 129-142, January-February, 1998. Kayarel, E. T., and D. P. Hinson, Sub-Fresnel-Scale Vertical Resolution in Atmospheric Profiles from Radio Occultation, Radio Science, vol. 32, pp. 411- 423, 1997. Tyler, G. L., G. Balmino, D. P. Hinson, W. L. Sjogren, D. E. Smith, R. T. Woo, S. M. Asmar, M. J. Connally, C. L. Hamilton, R. A. Simpson, Radio Science Investigations with Mars Observer, Journal of Geophysical Research (Planets), vol. 97, no. E5, May 25, 1992. Tyler, G. L., Radio Propagation Experiments in the Outer Solar System with Voyager, Proc. IEEE, Vol. 75, No. 10, pp. 1404-1431, 1987. Eshleman, V. R., The Radio Occultation Method for the Study of Planetary Atmospheres, Planet. Space Sci., Vol. 21, pp. 1521-1531, 1973. Fjeldbo, G., A. J. Kliore, and V. R. Eshleman, The Neutral Atmosphere of Venus as Studied with the Mariner V Radio Occultation Experiments, Astron. J, Vol. 76, No. 2, 123-140, 1971.